Quite intrigued by this one. 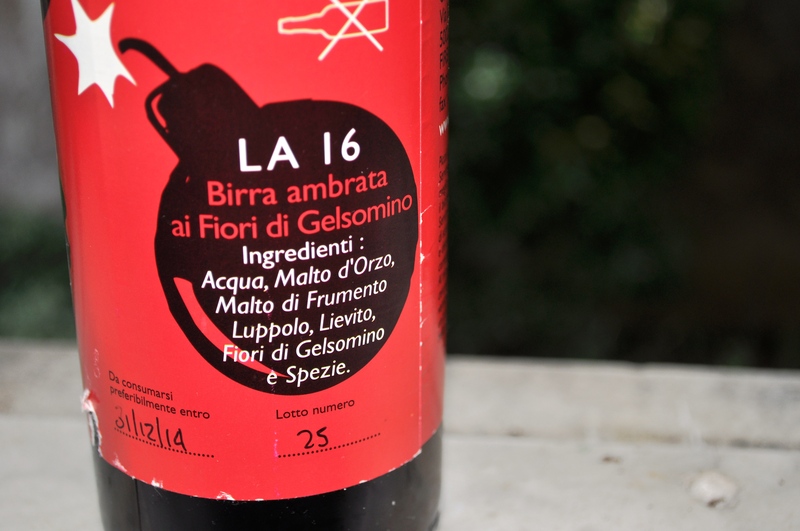 I’d enjoyed my previous experience of a brew from Math brewery (birrificio), La 68, a wheat beer I drank when experimenting with making fish and chips and the label on the La 16 said it was a Birra ambrata ai fiori di gelsomino – an amber beer with jasmine blossoms. The ingredients once more included the cryptic spezie too (spices – but what blimmin’ spices?). What’s not to like? Well, I was slightly wary of the 7% ABV. I would have thought I was getting used to Italian strong beers, but it seems to be going the other way. Especially as I drank this shortly after coming home from a trip to England, and enjoying several quality ales with less than 5% ABV. One tricky factor at the moment is getting the temperature of the beer right. It’s been around 35C for several weeks now, peaking even higher a few weeks ago. Ergo, I keep my beers in the fridge, reasoning that I can take them out and let them warm up a bit before drinking. It’s not an exact science though; my food thermometer has died, so I’m having to guess when the beer is at the ideal 10C-ish. 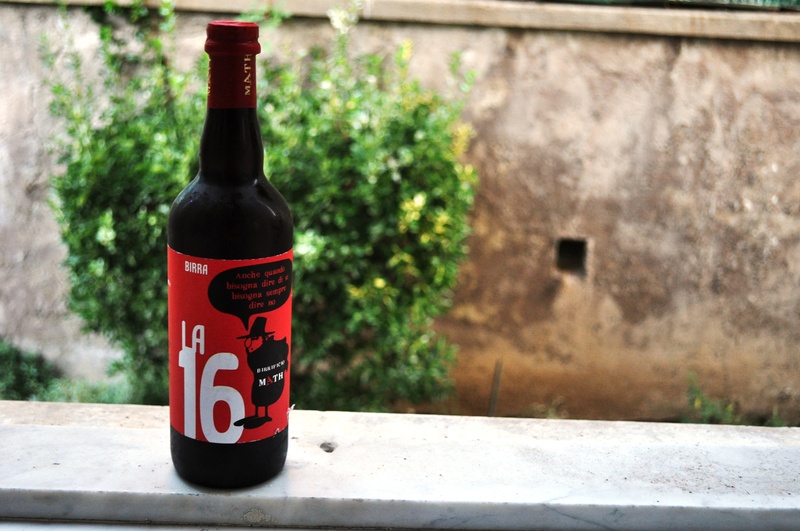 Maybe I guessed wrong this time, but drinking the La 16 I really got surprisingly little interesting perfume. I thought the jasmine flowers would make their presence felt, but I didn’t get that at all. Perhaps it was still too cold? Or perhaps it’s just not as great a beer as I was hoping. Tasting it too, I didn’t really get much floral or spicy. Very little fruitiness at all, just a fairly heavy malt and decided heavy hoppiness. So: not well balanced. 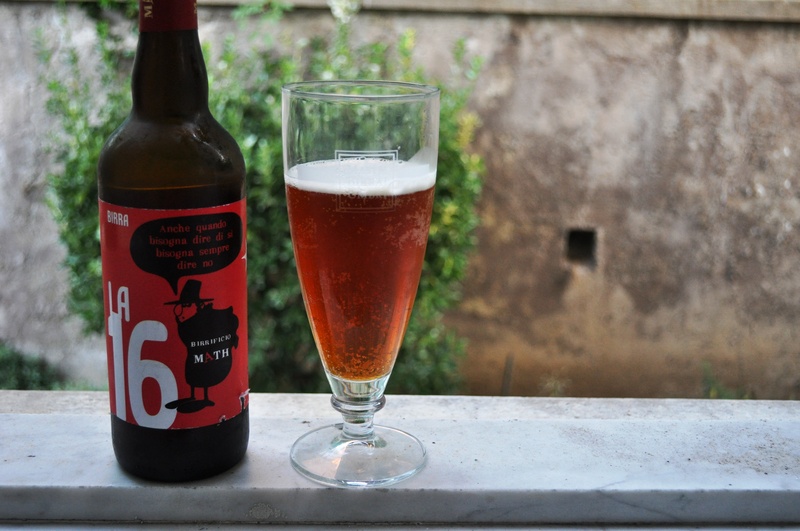 Medium body, medium carbonation, pleasant coppery brown colour, borderline unpleasant taste. It was assertively bitter, to the point of being too much, as if the hops have been cooked too long. Stewed, like an old cup of tea. Or at least it was too stewed for my taste. I’m really beginning to not enjoy these Italian strong ales (sometimes called “Belgian style” – but I dislike that expression. There are so many types of Belgian beer, it’s too vague). They’re just not subtle. Drinking them is like eating gelato (or ice-cream) too fast – you get that instant ache at the front of the brain. You’re punched with the hoppiness, with the high alcohol content.